The second satellite, MUOS-2, was delivered in May 2013 and launched atop a United Launch Alliance Atlas V rocket in July 2013. Image courtesy of Lockheed Martin Corporation. The United Launch Alliance’s Atlas V rocket lift-offs with the second MUOS satellite. Image courtesy of United Launch Alliance. The fourth MUOS satellite was integrated with multi-beam antenna in April 2013. Image courtesy of Lockheed Martin Corporation. 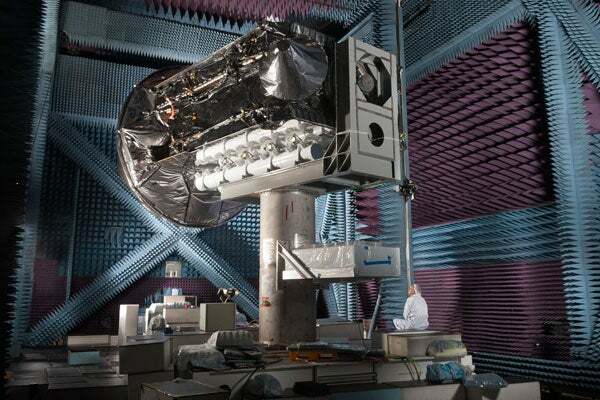 The Mobile User Objective System (MUOS) is a next-generation narrowband military satellite communications module being developed by Lockheed Martin Space Systems, for the US Navy. The MUOS module is designed to offer enhanced and secure communications, including voice, video and data for warfighters on the move. The MUOS satellite network is expected to achieve full operational capability in 2017 and ensure the availability of UHF narrowband communications for the US Navy past 2025. The MUOS is also expected to serve the Australian defence forces. The MUOS is a satellite constellation designed to replace the military’s ultra-high frequency follow-on (UFO) system, and offers improved communication capabilities for mobile and fixed-site terminal users through common air interface (CAI) and wideband code division multiple access (WCDMA) waveforms. The MUOS module has a wingspan of 92ft, bus width of 14ft, and bus height of 26ft. The dry weight of the system is 6,800lb. The antenna diameter of the module is 46ft. The MUOS can operate in orbits up to 22,236 miles away from the earth. The MUOS programme includes four geostationary earth orbit (GEO) satellites and one on-orbit spare. Each satellite has a design life of 15 years and can carry two payloads including WCDMA and legacy ultra-high frequency (UHF) satellite communications (SATCOM). The transmitting power of the satellites is 9.8W. The system operates through a fibre-optic terrestrial network, which connects four ground sites, including Hawaii, Norfolk, Sicily, and Australia. "The system operates through a fibre-optic terrestrial network, which connects four ground sites, including Hawaii, Norfolk, Sicily, and Australia." An 18.4m Ka-Band antenna system installed on the MUOS enables communication between the satellite and the MUOS ground stations. Lockheed Martin delivered the first MUOS satellite, named MUOS-1, in December 2011. The MUOS-1 was launched atop a United Launch Alliance Atlas V rocket from Cape Canaveral Air Force Station, Florida, in February 2012. On-orbit testing of the MUOS-1 was completed in July 2012. The second satellite, MUOS-2, was delivered in May 2013 and launched in July 2013. The satellite completed on-orbit testing and was handed over to the US Navy in December 2013. The Naval Satellite Operations Center relocated the MUOS-2 in its operational slot, where the satellite was tested and evaluated before its formal commissioning by the government in 2014. "Lockheed Martin completed the multi-beam antenna installation of the fourth MUOS satellite, MOUS-4, in April 2013." Lockheed Martin completed the multi-beam antenna installation of the fourth MUOS satellite, MOUS-4, in April 2013. The third and fourth satellites, MUOS-3 and MUOS-4, were respectively launched in January 2015 and September 2015. A consortium led by Lockheed Martin Space Systems secured a $2.1bn contract from the US Navy Space and Naval Warfare Systems Command (SPAWAR) in September 2004 to provide design, construction, and acquisition and operations support for the first two MUOS satellites and associated ground-control equipment for the US Navy. Lockheed Martin Space Systems is the prime contractor and system integrator for the MUOS, while the consortium consists of General Dynamics C4 Systems, Northrop Grumman Corporation, and Boeing Satellite Systems. General Dynamics C4 Systems was contracted by Lockheed Martin Space Systems in September 2004 to provide the user-entry and associated ground system for the MUOS satellites. General Dynamics C4 Systems provided a JTRS-compliant terminal solution, a secure ground network, satellite control and network management for the first two satellites. Northrop Grumman Corporation secured a $4m contract from Lockheed Martin Space Systems in July 2006 to provide Scalable SIRU inertial navigation systems for the first two MUOS satellites. In February 2009, Lockheed Martin received the UHF legacy communications payload and the first digital channeliser from Boeing Integrated Defense Systems. Lockheed Martin Space and Strategic Missiles selected Harris Corporation for a risk reduction design development (RRDD) programme to provide two space-borne unfurlable mesh reflectors for each MUOS satellite. Harris manufactures the 5m and 12m reflectors at its facilities in Palm Bay, Florida, for the MUOS satellite’s UHF band antenna system. The reflectors will have gold mesh reflective surfaces. Harris successfully demonstrated its Falcon III AN/PRC-117G multiband manpack radio compatibility with the MUOS in December 2013. Lockheed Martin, in collaboration with Rockwell Collins, conducted airborne testing of the MUOS and WCDMA (Wideband Code Division Multiple Access) waveform in November 2013.